Wel­come back to Plumb­if­er­ous, and hap­py New Year! Our first album of 2010 is, quite fit­ting­ly, from the solo project of Alex Schaaf, front­man of The Chairs, skilled cre­ators of our 2009 top album, Nine Ways. 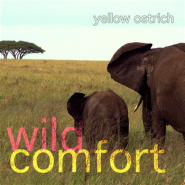 Schaaf’s newest album, Wild Com­fort, third to be released under the name Yel­low Ostrich, is simul­ta­ne­ous­ly more elec­tron­ic and sim­pler than any of Schaaf work with The Chairs - and there­fore enjoy­able in its own way. With­out the musi­cal con­tri­bu­tion of oth­er Chairs mem­bers, Schaff’s work has def­i­nite­ly tak­en a turn towards sim­plic­i­ty, as well as elec­tron­i­ca. While there are cer­tain­ly still seg­ments of pure cacoph­o­ny, they’re devel­oped from few, rel­a­tive­ly sim­ple lines which are then heav­i­ly lay­ered. The most com­pli­cat­ed the album gets is maybe two or three synth/electric gui­tar lines plus a rather sim­ple per­cus­sion track, and between one and three vocal lines, and the album more than once relies on a sin­gle frag­ment­ed synth line accom­pa­ny­ing only one lay­er­ing of Schaff’s voice (the album is, in gen­er­al, quite lay­ered as far as vocals are con­cerned). Wild Com­fort there­fore, relies much more on Schaff’s knack for inno­v­a­tive and absolute­ly unique ideas than com­plex­i­ty and den­si­ty of any sort. And while this cer­tain­ly results in less emo­tion­al­ly com­pelling instru­men­tals, it also cre­ates amaz­ing sec­tions like the (per­haps overex­tend­ed) last part of the open­ing track, which begins with an unex­pect­ed chord change and quick­ly moves into vocal lay­er­ing over a sim­ple but high­ly effec­tive instru­men­tal sec­tion. Schaaf’s vocal style is clear­ly just as strong solo as accom­pa­nied by the orches­tral might of The Chairs, which serves him quite well through­out Wild Com­fort. Schaaf’s voice gen­er­al­ly mesh­es excel­lent­ly with the remark­ably syn­thy sound of the album, espe­cial­ly on tracks such as “Run Mon­ster Run,” where the intrigu­ing ebb and flow of his vocal style is best dis­played. On top of this, Schaaf employs vocal har­mo­ny expert­ly, cre­at­ing a rich, lay­ered sound. How­ev­er, at cer­tain points on Wild Com­fort, Schaaf’s voice seems odd­ly sub­dued, as if it’s been placed a bit too far under the music. Nev­er­the­less, for the most part Schaaf’s voice works quite well with the music as a whole. His­to­ry has shown Alex Schaaf’s ten­den­cy towards vivid sto­ry­telling in his music, and Wild Com­fort is no dis­ap­point­ment. Though Wild Com­fort relies some­what more heav­i­ly on rep­e­ti­tion that much of Schaaf’s work, it also includes sev­er­al excel­lent tales, most notably “Dmitri’s Fox­es,” told from the per­spec­tive of Russ­ian sci­en­tist Dmitri Belyaev’s domes­ti­cat­ed fox­es. Schaaf sings “You bred out fear,” and then bids his audi­ence farewell on Wild Com­fort’s clos­ing track, “ ‘Til I Dis­ap­pear.” Wild Com­fort is, in the sto­ries it tells, emi­nent­ly enter­tain­ing. Unfor­tu­nate­ly, there are prob­lems with Wild Com­fort. In con­trast to Schaff’s work with The Chairs, which sound­ed absolute­ly engross­ing and immer­sive regard­less of whether it was record­ed in a stu­dio or a dorm room, Wild Com­fort sim­ply doesn’t sound, from a tech­ni­cal stand­point, all that amaz­ing. Some­times lines will sound per­fect­ly decent, and some­times they (and this espe­cial­ly effects the per­cus­sion) sound as if they were made with low qual­i­ty key­board patch­es. Addi­tion­al­ly, there are some tracks that are all too repet­i­tive or bor­ing. “Spi­der,” by far the worst of the bunch, will con­vince you that some­one is try­ing to pound a dull nail into the back of your neck. Wild Com­fort is a gen­er­al­ly strong album that suf­fers from some, per­haps inescapable flaws. The vocals are clear­ly what makes the album work, mean­ing that the sec­tions devoid of vocals often drag or just get annoy­ing. Then there are a few tracks that are so exper­i­men­tal that they sim­ply grow tire­some, for exam­ple, the major­i­ty of “Run Mon­ster Run,” and final­ly there are the tracks that are mediocre for the most part and rely on one or two crys­tal­liz­ing moments, gen­er­al­ly near the end of the track, that intend to make the whole track worth­while, and only some­what man­age to do so. But even among all this, one can­not escape the feel­ing that Alex Schaff is sim­ply a musi­cal genius, and more impor­tant­ly, a musi­cal genius that is also a ter­rif­ic singer. Wild Com­fort has its highs and lows, many of which are inten­tion­al, and whether indi­vid­ual bits work or not, the album as a whole cer­tain­ly leaves the lis­ten­er on an over­all high note.